Dillenia Suffroticosa (Wormia suffruticosa), known as Simpoh Air in Bahasa Malaysa and Buan in Bidayuh. This distinctive shrubby tree grows vigorously on eroded soil, wasteland, forest edges and swampy areas. Everything about it is large. 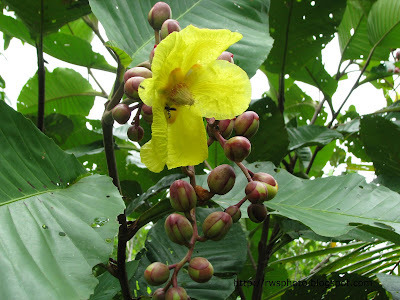 It has large leaves, and large yellow flowers. 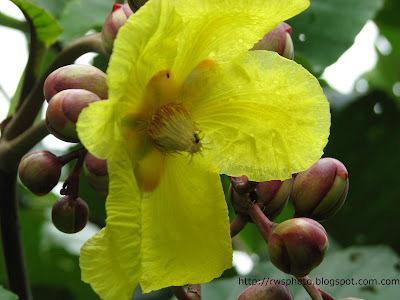 Dillenia, is a name derived from the personal name Dillenius, a German botanist (1684-1747). The unopened fruits are surrounded by thick red sepals. To distinguish them from flower buds, the fruits face upwards while flower buds face down. The ripe fruit splits open also at 3 am, into pinkish star-shaped segments to reveal seeds covered in red arils. The plant blooms from age 3-4 and can live for 50-100 years! Plants in the Simpoh family (Dilleniaceae) hiss when the trunk or a branch is cut (you have to put your ear to the cut to hear it). The sound comes from the air that is sucked into the cut vessels. The large leaves of the Simpoh Air were used to wrap food such as tempeh (fermented soyabean cakes), or formed into shallow cones to contain traditional "fast food" such as rojak as well as being used to wrap cooked rice. The Simpoh Air sends out very deep tap roots to reach underground water sources. So much so that their presence suggests an underground water source, and some people use the plant as a guide to decide where to dig a well. The timber is not useful because it is twisted and very hard. 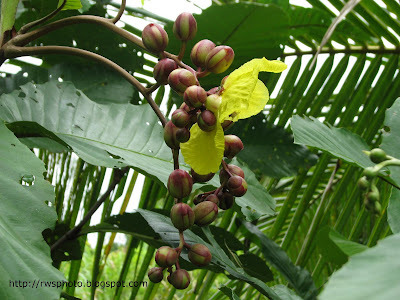 Simpoh Air is used to staunch bleeding wounds, and the fruit pulp may be used to wash the hair (Brunei).